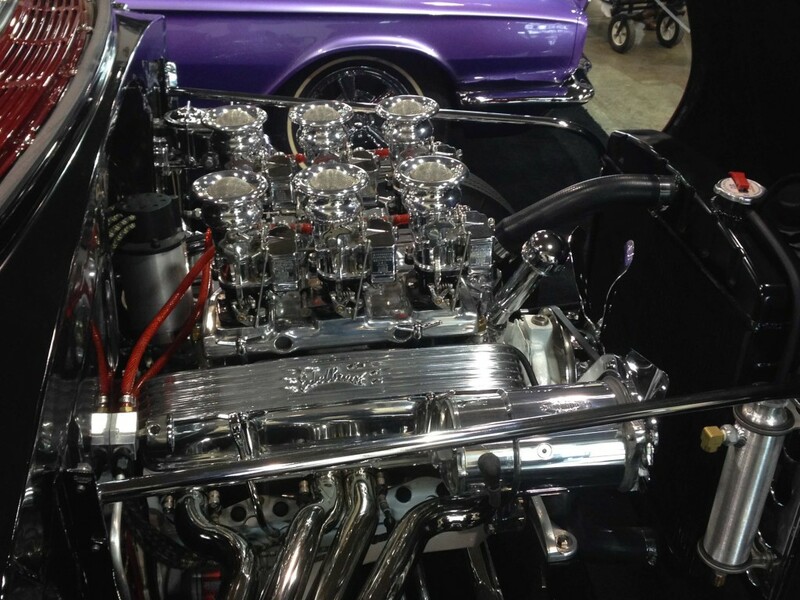 Multiple Stromberg 97s on a Hemi! Four 97s on a Hemi! Multiple 97s on your hot rod motor? Sounds good, doesn’t it? Check out this great Stromberg feature on the HOT ROD website! 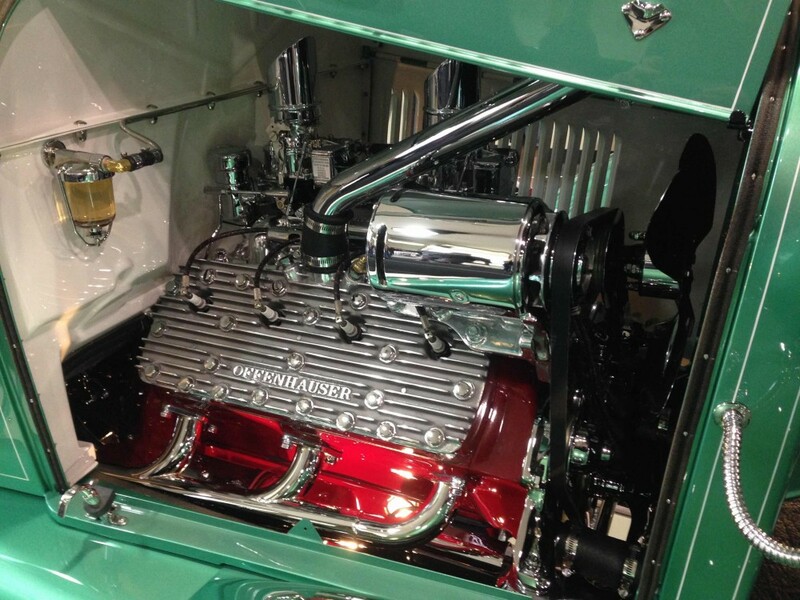 Written by Barry Kluczyk, we follow Bill Jagenow, at Detroit-area Brothers Custom Automotive, as he installs and tunes four new Genuine 97s on a DeSoto 291 Hemi under the hood of a 1940 Ford. As Bill says, “It’s very easy to overdo it with a multi-carb setup. 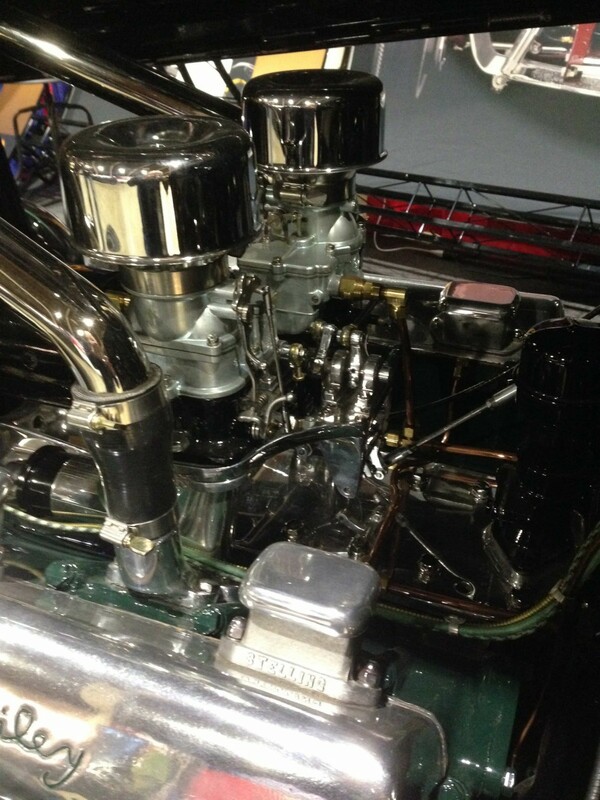 The 291 Hemi is not a large-displacement engine for four carburetors, so we’re backing off the fuel supply a little. We’ll start with the ‘41s’ and see how it goes after the engine is running again. We’ll check the plugs and make adjustments as necessary, but experience suggests they’ll be the right jets.” Just one thing. Bill recommends fuel pressure at 3.5psi. We prefer 2.5psi. According to HOT ROD, “With the air horns back in place, the soldier-like formation of the quartet of Stromberg 97s looks strong. Because there are so many connections on a multi-carb setup, it’s important to check for fuel leaks and the tightness of carb mounts after the first few drives, but with the synced carbs all performing strongly, the driving experience of the Hemified 1940 has never been more fun or responsive. Royal Kustoms down on England’s south coast might not be well known to our USA friends, but in the UK, proprietor Jim Turnbull and his team have a huge reputation for quality work on early Fords. 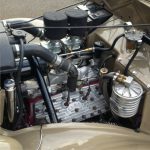 Jim has long been one of the ‘go-to’ guys for flathead engines, but in recent years he’s also become the number one destination for customers looking to compete in the toughest of long distance classic car rallies. Now, we’re not talking sedate cruises across a couple of counties here, stopping off at a restaurant and a vineyard on the way. We’re talking a seriously competitive thrash across Siberia (Northern Russia), through South America or from Peking, China to Paris, France. Most of it’s not even on what you could term roads either, so the cars have to be built tough to last even the first day, let alone the month long trip. On our recent visit, the shop was packed to the ceiling with old Fords, including more ’40 Ford coupes than we had seen for a long time. 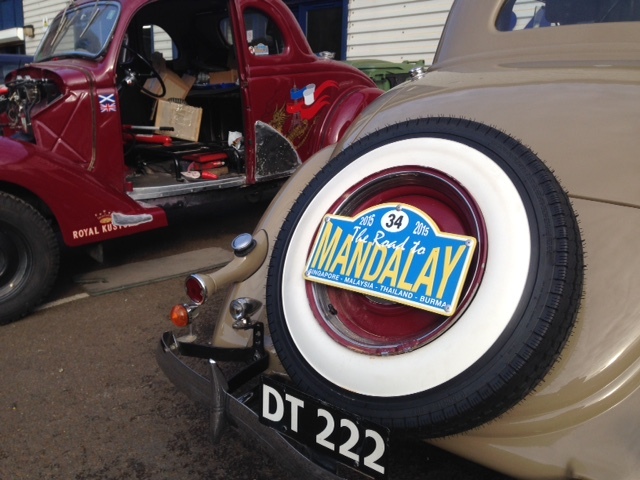 But these are not your regular old Fords. They’re built to the hilt, hard charging, double reinforced early Fords that can take more of a serious pounding than you might imagine. When you’re in the middle of nowhere, you can’t take chances. Fuel system? You need two. Throttle cables? Two. Ignition system? Two. Giant shocks front and rear with hydraulic bump stops. Knobbly off-road tyres. World Class 5-speed manual transmissions. Fuel tanks the size of the Exxon Valdez (but safer). Nine inch rear ends. Full GPS tracking and navigation equipment. And so it goes on. Did we mention super-reliable carburetion? Always Stromberg 97s of course. We were at the shop as part of our ongoing test programme for the forthcoming new Stromberg flathead distributor. Check the pictures out. It’s a very cool place The work is top notch, and so are Jim, Julie and the Royal Kustoms team. Thanks to them all! Where to put the spare. 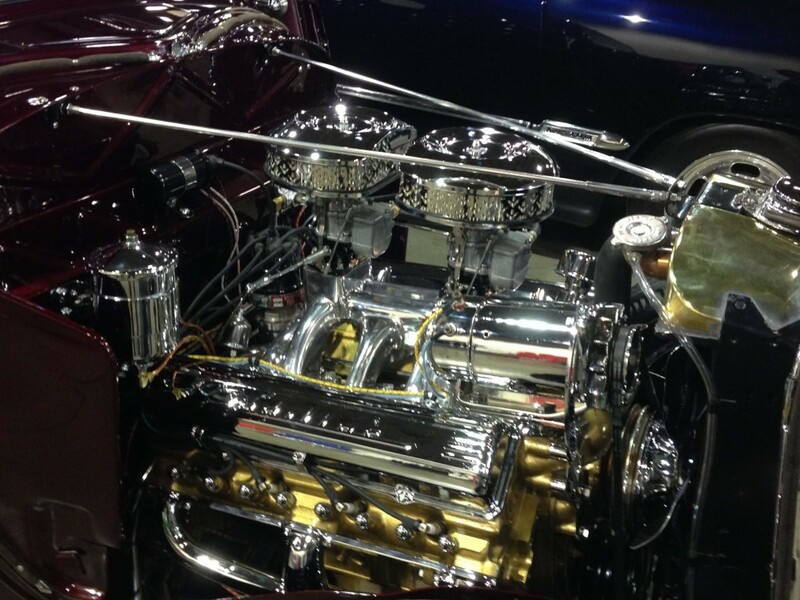 The Grand National Roadster Show is always a blast, and this year it was as good as ever. Seven halls of hot rod and custom excellence plus many visitors parked in between. You’ve probably seen endless pictures of the cars already so here’s a few shots of the Stromberg 97 carbs on show, both regular and BIG97s. Thanks to everyone who took the time to meet us at the H&H Flatheads booth this year. And of course, a big thank you to everyone who chose 97s for their GNRS entry. Hopefully, this might give folks a few more ideas about how to use 97s on your own projects. Thought it was about time we wrote something on the almost mythical Stromberg 97 1-1 model. You don’t see many of them because they were never a stock OE fitment on any new Ford cars. 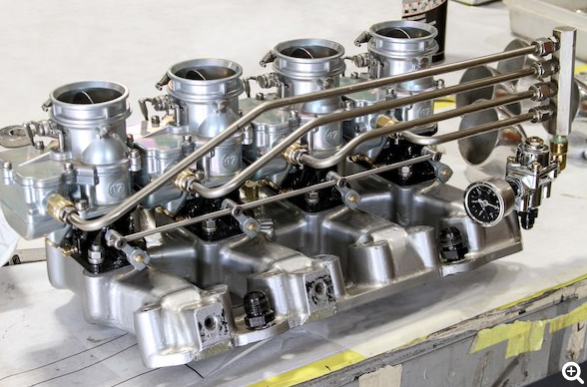 Instead they were an aftermarket fit (to replace the Ford/Holley carburetor) for 1949 to ’53 Ford cars and small trucks with the infamous Load-o-matic distributor. So how do we ID them, and why are they special? First off, note the writing on the side of the float bowl. By the time these came out, Stromberg had moved from South Bend, Indiana, to Elmira, NY. To the left of that, under where the kicker linkage goes, you will see a small 1-1 mark just above the circle with the 31/32 mark. The being a different bowl casting, the Stromberg part number – P-20671 – just above the 31/32, is changed from the P-21951 on regular 97s. In case you wondered, 31/32 is the size of the venturi in inches. 0.96875 inches, which is why it’s called the 97. There is another 1-1 mark under the bowl – check out the pictures. While this example has the vacuum port, not all Elmira or 1-1 carbs have it. Most of these late model 97s also used this weird looking ‘W’ or ‘arrow head’ base. I have no idea why they changed to this ugly lower flange shape, but it’s interesting that many an aftermarket (i.e. 1950’s) intake manifold has the same shape mounting platform. Back then, you could buy 97s brand new, and this is what they came with, so I guess it makes sense. Something else 1-1 carbs share is the ‘extra’ off-idle transition circuit. 97s were traditionally known for a slight off-idle hesitation. These two extra fuel circuits – you can see the small brass nozzles in the base/throttle body casting in the pictures – were the fix. They needed a brass jet because, by then, the throttle plate is moving away from the throttle bore wall and the exit for the fuel needed to be close to the edge of the plate to generate the correct local vacuum signal to pull the fuel out. That’s why the tips are angled to match the arc of the plate as it comes up. Eagle eyed readers will also notice that the plugs in the back of the base are extra large – needed because those little brass jets were inserted though those holes in the back of the casting into a seat on the opposite wall. OK, let’s talk about the important part. As we said, the 1949-’53 Ford flatheads used the new Load-O-matic distributor, which, amongst its many failings, is the fact that it has no mechanical advance mechanism. It’s ALL vacuum controlled advance. So its compatible carburetor has to provide the right vacuum conditions all of the time. 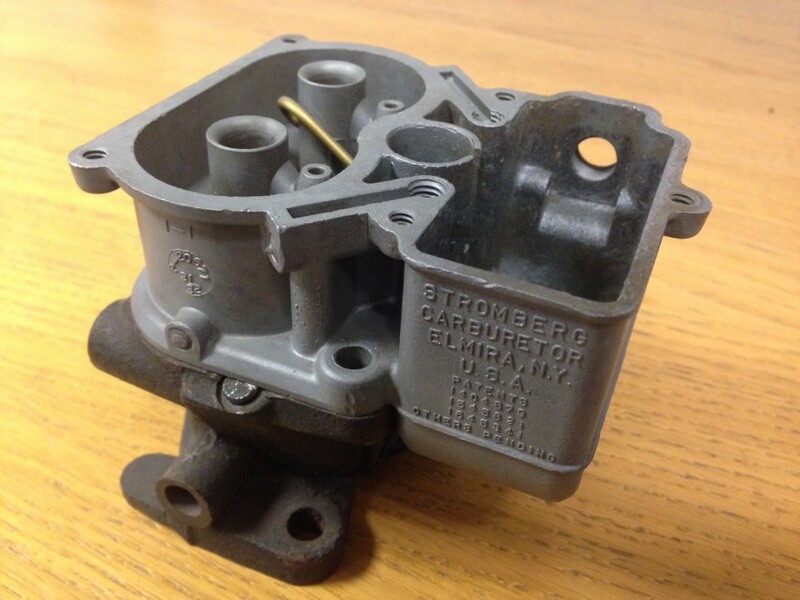 This is why a typical ‘ported vacuum’ carburetor like the Stromberg 9510A-VP, for example, cannot work with the Load-o-matic distributor. 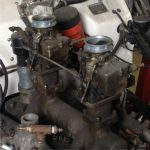 The key to this carb’s compatibility with the Load-o-matic is the fact that it takes vacuum from two different places inside the venturi and throttle body. One is what you’d term the usual ‘ported vacuum’ position in the throttle body, just level with the transition ports, which is above the throttle plates at idle. The other is a small brass jet pressed into the bowl casting right at the narrowest venturi point. It had to be inserted from the outside, of course, hence the extra boss and lead plug on the outside of the bowl casting, just beneath the kicker linkage on the side. The fat extra boss on the side of the base is where you connect your distributor vacuum tube of course. The fact that the actual vacuum hole is tiny, almost hidden in the bottom of the huge fitting thread is indicative of the ‘hokeyness’ of the whole set-up. It’s hard to beat the patina of old chrome Strombergs – those 97 carbs lucky enough to have felt the polisher’s hand way back when. Knowing what we do now about how hard it is to chrome passivated zinc, it’s a miracle any were done in the first place, let alone survived. But we’re glad they did. It’s like they have a life all of their own. If they could talk, what stories would they tell? Whatever their history, here’s a few examples of old chrome Strombergs that are still doing great duty in their current lives…..Click on the pics for bigger views.